Ethiopians of Muslim faith have taken to the streets of Ethiopia to peacefully demand religious freedom in Ethiopia. According to their demonstration organizers, the numbers of protesters will increase to new levels of participation in the coming days and weeks; while at the same time, the TPLF/EPRDF government warns of new cracks down, some of which have already taken lives, injured young and old and resulted in the arrests of thousands of political prisoners. This is no easy issue to resolve. Freedom of religion is close to the hearts of millions of Ethiopians, not only Muslims but all people who seek to pursue their faith and conscience without restriction. This has created a deadlock where the TPLF/ERPDF’s position is unsustainable without making concessions; however, based on past actions, it is highly doubtful that the TPLF/EPRDF will take the necessary steps to prevent the situation from escalating out of control, especially if the TPLF/EPRDF-sponsored violence against civilians is continued. The Solidarity Movement for a New Ethiopia (SMNE) strongly urges the TPLF/EPRDF and all its security forces to genuinely uphold the Ethiopian Constitution, first by not interfering with the legal right of Ethiopian citizens to peacefully protest. Any violence at the hands of the TPLF/EPRDF or others, resulting in injury or murder, that is directed at unarmed, peaceful protesters may be considered acts of terrorism against the Ethiopian civilians. Those individuals involved, both those giving the orders and those executing them, may be charged with terrorism in due time. Under international laws, perpetrators may also be charged with crimes against humanity. We caution the TPLF/EPRDF to not harm any peaceful protestors during this legal protest even more so because your government is already becoming increasingly known for its serial human rights violations against innocent Ethiopians. Secondly, as Ethiopian Muslims protest TPLF/EPRDF interference in their internal religious affairs, we urge the TPLF/EPRDF to relinquish control of religious organizations, a right given to all Ethiopians in the Constitution of our country yet also denied to Ethiopians of other religious traditions, like Ethiopian Orthodox, Evangelicals, Jews and others. According to organizers, Ethiopian Muslims seek religious freedom within a secular society where all Ethiopians have the same freedom of worship along with other basic rights. They have called on the TPLF/EPRDF to follow the Constitution; however, this struggle for religious rights is not new. The TPLF/EPRDF has waged a decades-long assault on religious organizations and people of faith which now includes government control of Muslims leaders and educators, forcing leaders of their own choosing on Ethiopian Muslims. Those chosen to lead the Supreme Council of Islamic Affairs are leaders who will not challenge TPLF/EPRDF authority and who are also seeking to impose the teachings of a Middle Eastern sect of Islam, strongly opposed by Ethiopian Muslims. The TPLF/EPRDF has also exerted pressure on the Ethiopian Orthodox Church to accept leaders of their choosing, ensuring cooperation with the regime. As a result, the church is split in two, one in exile and one in Ethiopia. This is against the law. Recently, Gebremedhin Araya, the former TPLF head of finance and a close colleague of former Prime Minister Meles Zenawi, revealed just how calculating, determined and brutally executed was the TPLF plan to destroy both Islam and Christianity in Ethiopia, starting in the Tigray region. Please click at the link to read Gebre Medhin Araya piece, http://ecadforum.com/2013/07/27/who-were-they-then-who-are-they-now/ He also names those allegedly involved, many of whom still maintain positions of power within the TPLF/EPRDF. The Marxist-Leninist underpinnings of the revolutionary democracy of the TPLF/EPRDF have been hostile to our Ethiopian people of faith from its onset. The assault on religion was carried out with similar brutality from the beginning of the TPLF (TLF) rebel movement—with murder, kidnappings, disappearances, and widespread intimidation. It continues today. This attempt to diminish belief in God and the moral authority of religious organizations was also clearly laid out in the TPLF/EPRDF strategic plan from 1993. Please click at the link to read the TPLF/EPRDF strategic plan http://www.enufforethiopia.net/pdf/Revolutionary_Democracy_EthRev_96.pdf. This plan, which was distributed to TPLF/EPRDF members as a means “to establish hegemony and perpetual rule”, provides documentary evidence backing up Ato Gebremedhin Araya’s allegations. Part of this plan included the infiltration of religious groups in order to counter their influence and use them to serve the goals of the TPLF/EPRDF. As many shudder at the evil intent of the TPLF/ERPDF to destroy sincere religious practice, no one can deny the TPLF/ERPDF’s success in intruding into the affairs of Ethiopian religious institutions. Ironically, the hope of a more just, caring, equitable and reconciled Ethiopia may rest on the shoulders of those people of sincere faith who can provide the moral strength, healing and direction necessary for the restoration of Ethiopia. People of diverse faiths may work together for the common good in ways unseen before this time. For eighteen months, Ethiopian Muslims have been protesting government religious interference without incident. They have shown respect towards others and there has been no violence or destruction of property. However, in the past months, the TPLF has arrested countless Muslim leaders and/or organizers of the protests and desecrated their mosque. In the last few weeks, the TPLF/ERPDF have increased the use of violence. In the cities of Kofale and Tatolamo, the TPLF/EPRDF used excessive force against unarmed civilians that led to the killing of innocent people, including women, children and elderly persons. The death toll now stands at twenty-five. On August 8, the TPLF/ERPDF attacked Muslims in Addis Ababa, Dessie, Welkite and Afar as they celebrated Eid Mubarak. According to reports we received from people on the ground, many were seriously injured after being beaten with bats, the barrels of guns and other objects. Countless others were arrested. 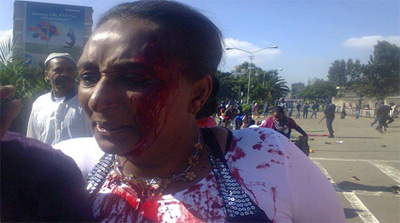 Eyewitnesses told the SMNE that the injured were denied treatment at local hospitals due to orders from the TPLF/EPRDF. A pregnant woman died of her injuries. We are very disturbed by these testimonies; however what is encouraging is how the injured were not only helped by other Muslims, but how Christians who lived nearby came to their rescue to help the injured. This is further evidence that this is not a religious issue between people of differing faiths but about government suppression of religion and other basic rights. These Christians who came out to help their fellow Ethiopians, even bringing the wounded into their homes, were connected by their shared humanity. When they were hurt, the Christians were there to help them. People of faith must stand together like this even while holding differing beliefs. As the TPLF/EPRDF commits increasing acts of violence, propaganda is being spread that their violence is necessary in response to Muslim extremists. This has not been part of the history of Muslims in Ethiopia but instead is a deliberate attempt to slander Ethiopian Muslims when it is increasingly apparent that it is the TPFL/EPRDF that has been committing acts of violence. The trademark of this regime, even when in the bush operating as a gorilla rebel movement, was to create false flag operations where members of the TPLF committed acts of terrorism while posing as the enemy. At that time, the U.S. State Department had classified the TPLF as a terrorist group and little has changed. We have previously spoken of other more recent false flag acts perpetrated for political and economic reasons, including one in Addis Ababa that appeared in Wiki leaks where the TPLF/EPRDF set bombs in Addis Ababa in order to blame, charge and arrest various opponents to the regime. Another example relates to a prior planned Muslim protest several months ago that was called off after its leaders learned of TPLF/EPRDF plans to hijack the peaceful demonstration by posing as Muslim protestors and burning the American flag. No one should assume that any violence that might occur in future protests is the fault of the protestors. Instead, we believe the most likely perpetrators will be the TPLF/ERPDF, who should have the burden of proving any future allegations against Muslims in an unbiased, independent court of law. No one trusts the TPLF/ERPDF anymore. The TPLF/EPRDF’s tactic of using false flag operations, threats and violence to silence the legitimate rights of Ethiopian Muslims is wrong. If they were people of violence, they would have shown this in the last nearly two years; however, Ethiopian Muslims, Christians, Jews, animists and non-believers have lived together in harmony for centuries. It is this ethnic-based government that has been trying, with little success, to incite division between religions. Ethiopian Muslim and Christians make up almost our entire population of our nation. The background of both of our faiths, along with the Jews, comes from the line of Abraham; giving us a common origination of our belief in one God. Even though we still have differences of belief, we Ethiopians have gotten along quite well for many hears until more recently when the ethnic apartheid regime of the TPLF/EPRDF has been using our religion to divide us. We, Ethiopian Muslim, Christians and Jews are more than neighbors; we are part of the Ethiopian family and part of the human family. We not only share the land, but the blood that runs through our veins has been passed on to us by shared ancestors. Our safety and survival depends on each other and we need to be there for members of our family. This is something demonstrated by our Ethiopian ancestors before us and we should treasure this legacy. Our ability, as diverse religious people, to live together with respect, tolerance and peace is a cause for celebration in this world where Ethiopia is one of the few countries who have achieved this. Muhammad told his followers many years ago to find safety in this great land of ours. That tolerance is visible by going to a Christian church and finding a follower of Jesus Christ by the name of Mohammed or going to a Muslim mosque and finding someone named Peter worshiping Allah. The brothers and sisters around them worship together without suspicion or fear. This also goes back to the reality that there are many mixed families in Ethiopia where the husbands are Christians and wives are Muslims or vice versa; yet, unlike in some places in the world, there is no fear within or between families. This Ethiopian tradition of respecting the independence of religious beliefs is unique in the world and many outsiders do not know this. Now this religious freedom is being attacked by the ethnic apartheid regime of the TPLF/EPRDF as they are trying to make us fear, dehumanize and demonize one another. They used these same tools to reduce us to being “those others” or “tribes” or “collections of people unlike us” rather than human beings created by one God. All of us Ethiopians must stand together as one people against the TPLF/EPRDF’s policy and reject extremism of any kind: ethnic extremism, Muslim extremism, Christian extremism, tribal extremism and feudal extremism. All of these should be discarded if we want to get our country out of the mess it is in and to pass on a healthy Ethiopia to our descendants. Some of the non-Muslim Ethiopians may be suspicious of those rallying for their religious rights, saying that what they want is different from what we want. This is exactly the reaction TPLF/EPRDF regime is looking for. The TPLF/EPRDF’s brutal crackdown may be driven by several fear-based goals: 1) to maintain control of religious organizations because moral authority is a threat, 2) to alienate and divide Muslims from people of other faiths so there is no unity against your authoritarian rule, 3) to gain international support and financing for fighting the War on Terror by disguising the truth that these protests are based on legitimate legal rights and have been conducted in a peaceful manner from the start, and 4) out of fear the TPLF/ERPDF will collapse and violence will break out against power-holders. The SMNE is deeply concerned that this last scenario be pro-actively avoided by trying to find a way to improve relations between Ethiopians through meaningful reforms. The TPLF/ERPDF tendency to simply up the violence or to create a new law to charge the innocent is dangerous and may likely backfire. We believe it will simply escalate the problem and could cause ethnic violence and civil chaos. The SMNE, as a social justice movement which stands up for the rights of all Ethiopians, condemns this practice and urges the TPLF/ERPDF to instead find a peaceful and inclusive way to resolve these urgent concerns before it is too late. When these kinds of human rights abuses and the denial of justice are inflicted on any group of Ethiopians, it is inflicted upon all of us. We in the SMNE, together with other peace-loving people, call on donor countries and human rights groups to put pressure on the TPLF/ERPDF to respect the rights of Ethiopian citizens. We also call on media groups to be extremely cautious so they do not report TPLF/EPRDF-provided propaganda without substantial documentation and verification from witnesses on the ground. Ethiopians on the ground should do their duty to document what is going on and who is responsible, from the top offices of government to the streets. In the future, this kind of documentation will be needed in a court of law. We also call on all Ethiopians to stand up with their Ethiopian Muslim brothers and sisters because like we have said before, we do not only share land and a country but we also share blood, joy, pain and suffering together. When the TPLF/ERPDF government kills some of our family and puts others in jail; the TPLF/ERPDF are putting us in jail too. In a family there is no us and them. In the past, the TPLF/ERPDF has sought to divide and conquer Ethiopians through exploiting our differences but if the TPLF/EPRDF seeks a better future in a shared Ethiopia, the decisions you make in the coming days will be critical. If the TPLF/ERPDF continues with its characteristic brutal tactics, the people of Ethiopia will reach a limit of tolerance. If Ethiopia spins out of control, we know who is responsible. It will not be the Ethiopian Muslims but will be the TPLF/ERPDF and its security forces. As for the SMNE, we will continue to watch this very closely in order to protect the rights, value and dignity of every human life, including those in the TPLF/ERPDF and beyond, for no one is free until all are free. Let us restore the Ethiopian legacy of religious freedom and tolerance and be an example to our conflicted world; starting by building a bridge between fellow Ethiopians. This means we cannot let these members of our Ethiopian family rally alone. May God bring a change of heart, mind and soul to the TPLF/EPRDF, helping Ethiopians to see each other as part of His precious creation and as we do, may the rivers of love, kindness, acceptance, and justice overflow from our people, bringing life and blessings not only to Ethiopia but to the world.